The Moto Z was a surprise hit for Motorola — so much so that the company made the swappable, modular-backed phone its flagship product with the Z2 Play’s arrival last month. But the novel feature has always been hampered by the fact that there just aren’t that many useful Mods. While the company sold “millions” of that first phone, it’s only moved between one and two of the swappable backs for every handset. Today changes the math a bit, with the arrival of the Moto Z2 Force Edition, featuring a shatterproof screen and bigger battery, along with the 360 Camera Moto Mod — one of the more compelling Mods to date. Like its predecessors, the new Mod snaps on magnetically to the back of the handset, but with this one, a two-sided, circular camera juts out the top, like a small periscope. The new Mod shoots 360-degree video in 4K, like the new version of the Gear 360 that Samsung announced back in May alongside the Galaxy S8. Though, at $299, the Mod is a full $70 more expensive than Samsung’s model — and, of course, it only works with the Moto Z line. That speaks to one of the bigger issues with the Moto Z’s take on modularity — while all of the Mods are designed to be compatible with all versions of the Z, the system’s design defines the constraints of the phone’s form factor. Andy Rubin helpfully pointed that out when he debuted the Essential phone in late May, along with its own $199 360-degree camera. That upcoming device features a more adaptable take on modular design. Rather than requiring it to occupy the full back, Essential’s system just plugs in a pair of pins near the top of the phone. That means the handset can change screen size in the future (as handsets are wont to do) and still be compatible with the accessory. Motorola, on the other hand, seems to have painted itself into a bit of a corner on this one. That said, one key thing the Moto Z line has going for it is a year’s worth of shipping products. We’re likely still a couple of weeks out from the first Essential phone, and the Z is already a proven product, and the first genuinely successful modular phone. Motorola’s delivered a nice piece of hardware, and while the selection of Mods still isn’t huge, it’s certainly growing. The company is already offering a JBL speaker, a Hasselblad camera, a projector, a new gaming pad and a bunch of different battery packs. But now that the novelty of the first generation has worn off, Motorola needs to prove that Mods are enough of a value-add over standard phone accessories. After all, with something like the battery back, the Mod isn’t doing a lot that a case from a company like Mophie can’t already do on a standard, non-modular phone. 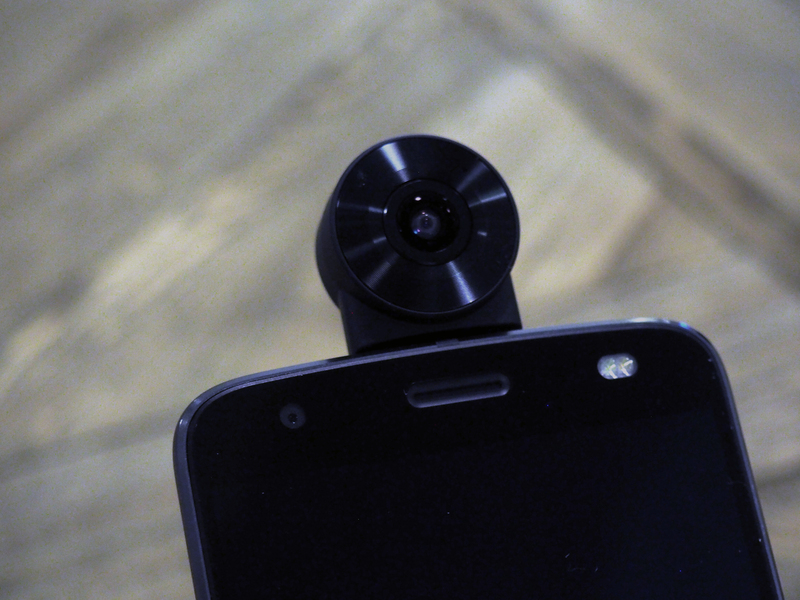 With the 360-camera, the Mod form factor is a trade-off. You can view what you’re recording in real time on the phone’s display, but you have to hold the phone in a hand or prop it up in order to use it. There are plenty of situations where it would be a heck of a lot handier to have a standalone camera (like the Gear 360) that you can place on a flat surface for extended shoots. Trying to shoot time-lapse that way sounds like a bit of a nightmare. The long-term health of the Moto Z line is going to depend on the breadth and usefulness of the Mods that are on the market. The Z2 Force looks to be another solid piece of hardware from the company, with a rugged design, two rear-facing 12-megapixel cameras and the latest Snapdragon processor, but the Mods are how the company is attempting to set itself apart. 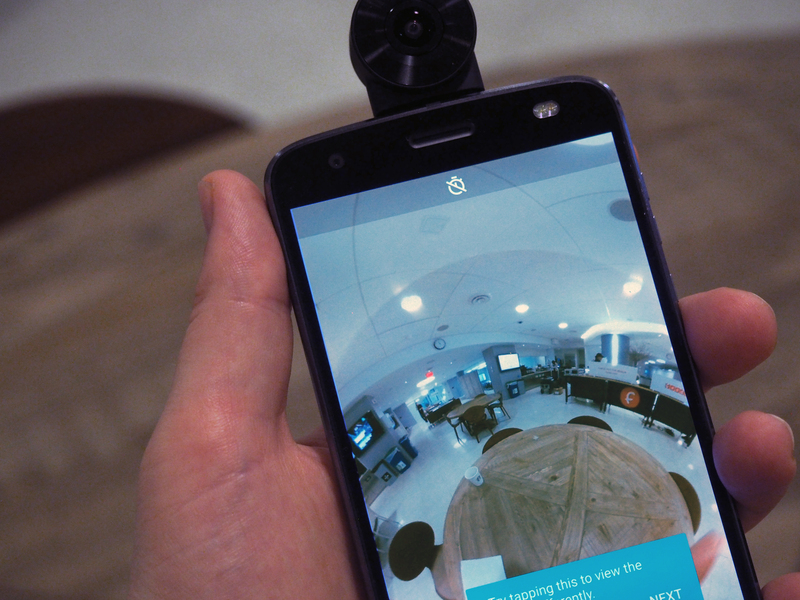 The 360 camera adds to the growing selection, but it’s hardly the killer app the company’s been searching for to make modularity more than just a cool novelty. Both the Moto Z2 Force and the 360 Camera Mod are due out August 10th through the major U.S. carriers.